Sometimes it's just best to go back to your roots. Hammerfall took some heat from fans over 2011's Infected for the lack of Hector, their mascot, on the cover and the perceived different character of the metal within. (I thought it was a pretty good album.) But now they return to the spirit of Glory to the Brave and Legacy of King with more 'keep it true' melodic power metal. Actually, Fredrik Nordstr�m, responsible for both of those hits, is back in the producer's chair for (r)Evolution. Though it's hard to beat those aforementioned albums, fans should know two things about this album. First, it's a definite return to form for the band and, second, not a single song should disappoint you. 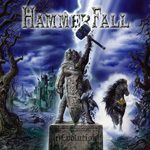 At the start, almost as group mea culpa to fans, Hammerfall offer's Hector's Hymn which is pure Hammerfall power metal, complete with the band's characteristic melodic choral gang vocals. The title track is even bolder with its metal chorale, and Bushido takes Hammerfall's traditional themes of warrior metal to the Land of the Rising Sun, again with a large and harmonious refrain. 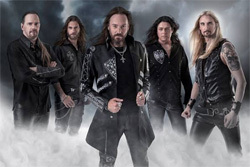 Hammerfall has also dabbled with and peddled songs of hell and demons, fear and death, often with more steady and heavy metal, rather than the rush of power metal. Both Ex Inferis and Evil Incarnate deliver upon this theme making the metal both striking and creepy at the same time. But swift power metal remains a standard with both Origins and Tainted Metal supply faster pace, without neglecting either groove or melody and, with any Hammerfall song, an abundance of guitar solos. Two songs stand somewhat in contrast with these themes. One isWinter Is Coming, a slghtly subdued metal ballad, moved most impressively by Anders Johansson's drums and Joacim Cans' passionate vocals. The other is Live Life Loud that, between it's groove, power, and catchy refrain, is simply a large arena ready anthem. Be sure the Cans and the band will be coaxing the crowd to shout back the chorus at the next concert. Once more, (r)Evolution is Hammerfall being the Hammerfall we all know and love. Is it as good as Glory to the Brave? I'll let that to the diehard fan to decide. Easily recommended. (r)Evolution is Hammerfall being the Hammerfall we all know and love, delivering their classic melodic power metal that made them kings of the genre.